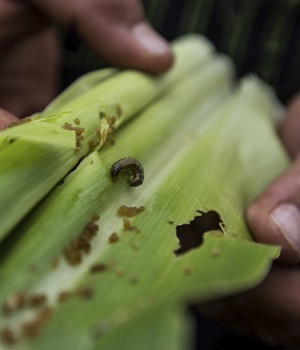 Juba - An invasion of fall armyworms may further damage South Sudanese farming, worsening shortages in the war-torn country where half the population is already facing hunger, a Food and Agriculture Organization official said. The pest that’s ravaged crops from Ghana to South Africa since arriving on the continent from the Americas last year has destroyed corn, sorghum and pasture in South Sudan, according to Felix Dzvurumi, the head of the FAO’s agriculture department in the country. The government and the United Nations agency are seeking $1m from donors to investigate the effects of the South Sudanese outbreak that started in June, he said. “It has quite a big potential impact on the food security of the country,” Dzvurumi said by phone from the capital, Juba. South Sudan, where a civil war that began in December 2013 has claimed tens of thousands of lives, is already suffering from mass hunger as fighting stops civilians tending their crops and inflation surges to more than 300 percent. An estimated 6 million people are facing severe food shortages, although famine is no longer occurring in two northern counties where it was declared in February. Agriculture Minister Adigo Onyoti Nyikwac on July 13 said fall armyworms had been detected in the southern region of Equatoria, known as the country’s breadbasket before violence spread there, and Bahr el-Ghazal, in the northwest. Addressing reporters, he said 166 000 hectares of South Sudan’s 664 000 hectares of arable land could be affected. Nyikwac warned the government has limited resources to contain the pest and it’s likely to spread. “If it goes to northern Upper Nile, where there is commercial farming, I am afraid we are finished,” he said, referring to an area near Sudan where much of the fighting has occurred. Kenya and Uganda, which border South Sudan, have also reported infestations. The outbreak of fall armyworms - caterpillars that get their name from the large numbers that invade fields and eat leaves and stems - could spread to Asia and the Mediterranean, the UK-based Centre for Agriculture and Biosciences International said in February.